O-Ring Kits - Buy o-ring kits online. Simple instructions show how o-rings and seals can be replaced making a tool in otherwise good condition "like new". Special lubricant is provided with every o-ring kit. Bumper Kits - Bumper kits are available online. All air tool repair kits enable the users to recondition these tools at minimum cost and with little "down-time". Simple instructions show how bumpers can be replaced. Trigger Valve Kits - Trigger valve kits are online. All air tool repair kits enable the users to recondition these tools at minimum cost and with little "down-time". Simple instructions show how triggers can be replaced making a tool in otherwise good condition "like new". Special lubricant is provided with every trigger kit. Miscellaneous Kits - See our complete parts line. 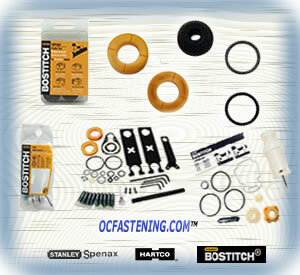 O-Ring Kit; Contains all o-rings necessary to rebuild the F21; F28; F33; N89C tools. Does not include trigger valve or trigger valve o-rings. Repair Kit; RN46B - All air tool repair kits enable the users to recondition these tools at minimum cost and with little "down-time". Simple instructions show how o-rings, seals and bumpers can be replaced making a tool in otherwise good condition "like new". Special lubricant is provided with every o-ring kit. Repair Kit; N62FN - All air tool repair kits enable the users to recondition these tools at minimum cost and with little "down-time". Simple instructions show how o-rings, seals and bumpers can be replaced making a tool in otherwise good condition "like new". Special lubricant is provided with every o-ring kit. Rebuild Kit; N66C - All air tool repair kits enable the users to recondition these tools at minimum cost and with little "down-time". Simple instructions show how o-rings, seals and bumpers can be replaced making a tool in otherwise good condition "like new". Special lubricant is provided with every o-ring kit. Rebuild Kit; MCN150; MCN250 - All air tool repair kits enable the users to recondition these tools at minimum cost and with little "down-time". Simple instructions show how o-rings, seals and bumpers can be replaced making a tool in otherwise good condition "like new". Special lubricant is provided with every o-ring kit.